The RODE Stereo VideoMic is a high-quality stereo microphone designed for use with camcorders, DSLR cameras and portable audio recorders. Two high-resolution 1/2" condenser capsules are mounted in a fixed X/Y stereo array, providing a very natural stereo recording, while still offering a high level of rear rejection. 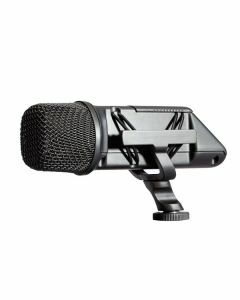 The Stereo VideoMic is an ideal microphone for capturing environmental and ambient sounds, as well as live music. For dialogue and directional applications the RODE VideoMic and VideoMic Pro are recommended. The RODE Stereo VideoMic stereo on-camera microphone is designed in Australia and covered by RODE Microphones' industry leading 10 year warranty.